Go fishing with our Kids Floor Rugs! Young children have an insatiable appetite for learning new things. 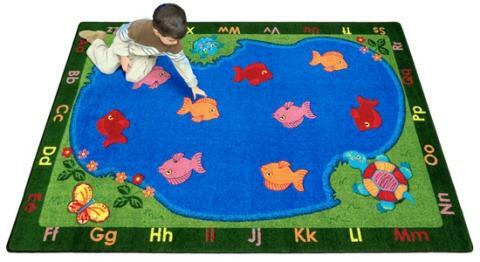 You can wet that appetite with our Kids Floor Rugs. We designed this rug with numerous colorful fish that appear in the center of the rug. 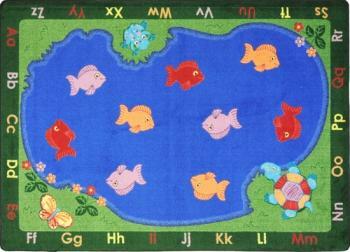 Surrounding the fish along the border are the letters of the alphabet. You can use this teaching tool to help your student phonetically sound the alphabet and for the words for commonly referred to fish. After recess, gather your children to sit on the Kids Floor Rugs for an engaging story time. You students will love the soft comfort provided by the Kids Floor Rugs. The tightly woven fibers protect against extremely hot or cold classroom floors. Our durable construction can handle the most rambunctious children. You do not have to worry about your young children inhaling loose fibers or the fume from ink dyes. We use printed design in all of our carpet and rug designs. Best of all, your students can bring their juice box to story time. Our anti-stain treatment makes cleaning up juice spills as easy as wiping the stain one time with a damp cloth.